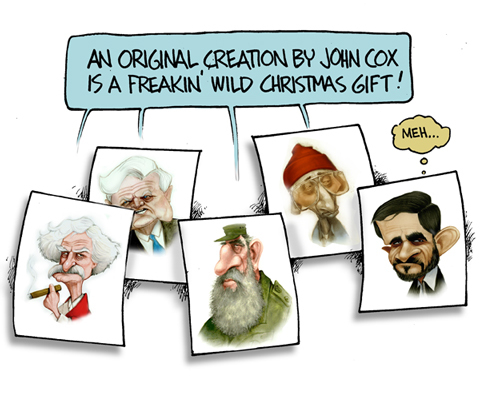 John Cox does excellent political/philosophical illustrations. Do you enjoy this website and know that special someone who could use a good laugh? Let me invite you to share the gift of humor by commissioning a caricature for the Christmas Season. For $75 (plus postage cost), you’ll receive a 9″ x11″ watercolor caricature based on photographs you can simply e-mail. Within three days of making a Paypal payment, I’ll send you a finished caricature that’ll be a hilarious Christmas story for years to come. Just contact me at my e-mail address, john555cox@hotmail.com, and we can get started!